In this solo dining adventure, Gary and friends lunch at Locanda Verde in TriBeCa’s Greenwich Hotel. Locanda Verde was created from an interesting combination – a chef who had yet to find a restaurant to call home and a space that was relatively new but unable to find success in the realm of dining. Chef Andrew Carmellini rose to prominence at Café Boulud parlaying that into opening his own restaurant A Voce in 2006, which went on to earn a Michelin star. In 2008, he suddenly left the restaurant he opened and guided to high praise, without warning and without much explanation. The only clue to why he left is the timing – his departure came around the time A Voce announced it was expanding to a second location, this one inside the Time Warner Center. Perhaps expansion was something Carmellini didn’t want or maybe he wasn’t being compensated appropriately in light of expansion. Who knows. He was gone shortly after expansion was announced. Then there’s the space itself. When the Greenwich Hotel opened in 2008, owner Robert DeNiro brought with him a location of his successful restaurant Ago. A celebrity opening a hotel and an outpost of a restaurant that’s done well in three cities – sounds like it’d be successful, no? Well, not so much. Ago at the Greenwich failed to impress critics and less than a year after opening, it was determined that a change would be necessary. 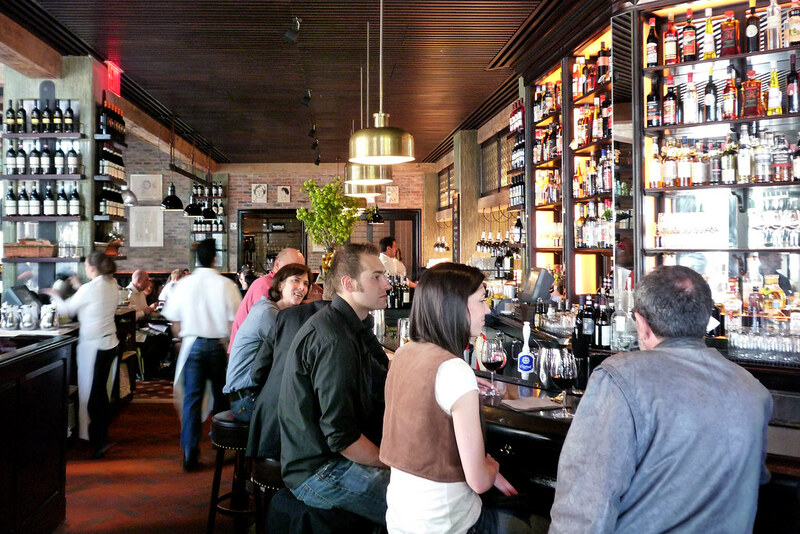 That change would come in the form of their new chef, Andrew Carmellini and a new name, Locanda Verde. After Frank Bruni’s two-star review last summer, it’s safe to say that the ship has been righted for DeNiro’s restaurant space. That’s hardly a surprise when you’ve got Josh Pickard of Chinatown Brasserie and Ken Friedman of the Spotted Pig helping out with the makeover. The space transformed, the menu revamped, the evil spirits vanquished, it looks like this restaurant is here to stay (or for as long as any stick around these days, without regard to success). So when Jess (Dave G.’s wife) emailed to say she’d be taking a Friday off and have lunch here, asking me if if I’d like to join them, my answer was a quick (eight minutes between emails) affirmative. To start, we shared an order each of the Lamb Meatball and the Sheeps’ Milk Ricotta. 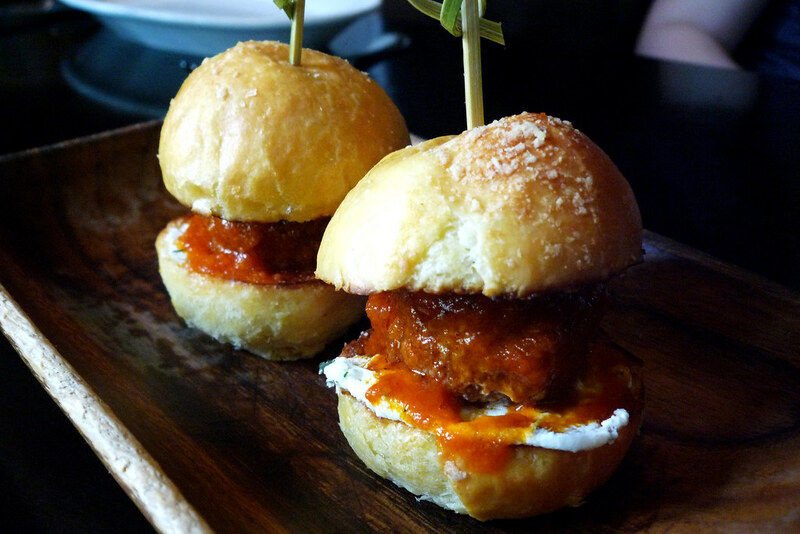 The lamb meatballs are basically lamb sliders with a coating of tomato sauce and a soft, creamy cheese spread onto the bun. The lamb meatballs are great, both in taste and texture. The caprino spread onto the bun adds a rich, creamy flavor making for a wonderful bite. But as wonderful as the lamb meatballs were, the sheeps’ milk ricotta easily surpassed them. Olive oil is drizzled onto it with sea salt and herbs sprinkled on top, which is nice but the creamy ricotta hardly needs any help here. I couldn’t stop myself from dipping my knife into it to spread more onto my toast. In fact, when we ran out of toast, I just started running my fork through the remainder of the ricotta, unwilling to leave any bit of it behind. For my entree, I had My Grandmothers’ Ravioli – well, not my grandmothers’ ravioli obviously but Carmellini’s grandmother. His grandmother’s ravioli are thin squares of pasta wrapped around a meat supreme’s worth of filling – beef, veal, and pork – with an appropriate amount of sauce and cheese crumbled on top. 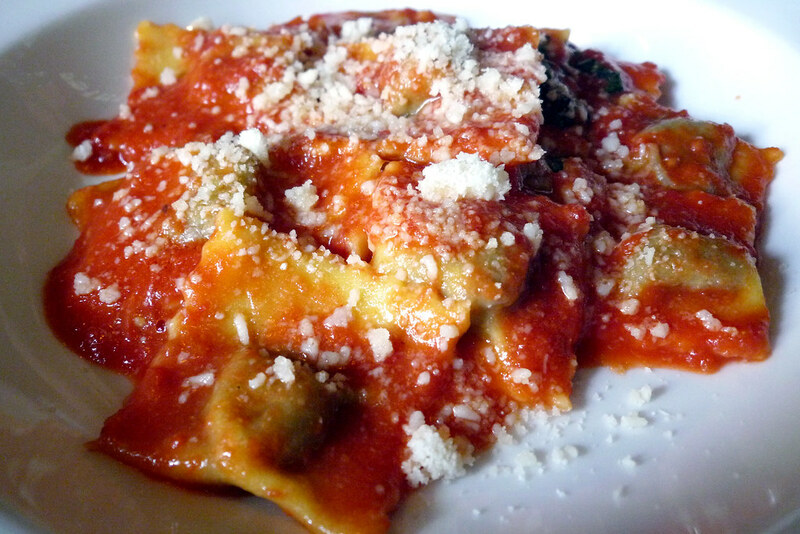 If the ravioli are any indication, Carmellini’s grandmother must be one amazing cook. Jess had the Scampi Ravioli while Dave G. had the Broccoli Rabe Sausage Grinder for entrees and I had a little of each plate. 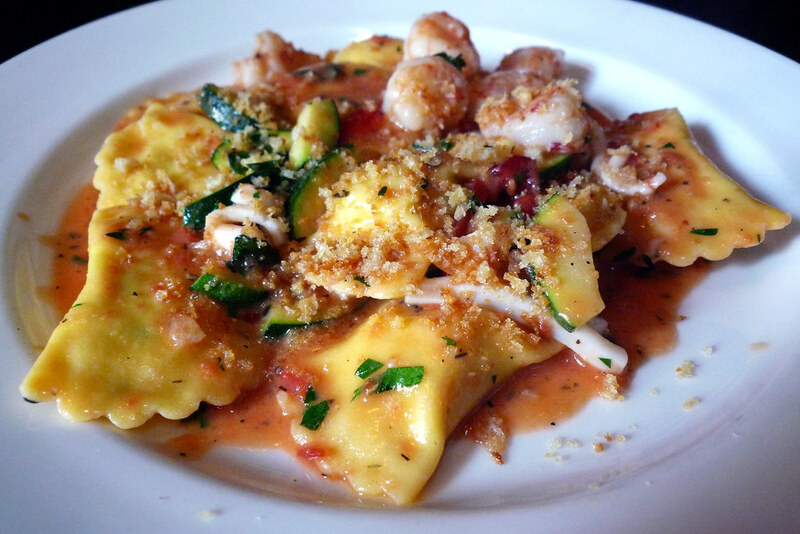 The scampi ravioli were tasty though not as good as the ravioli I had. 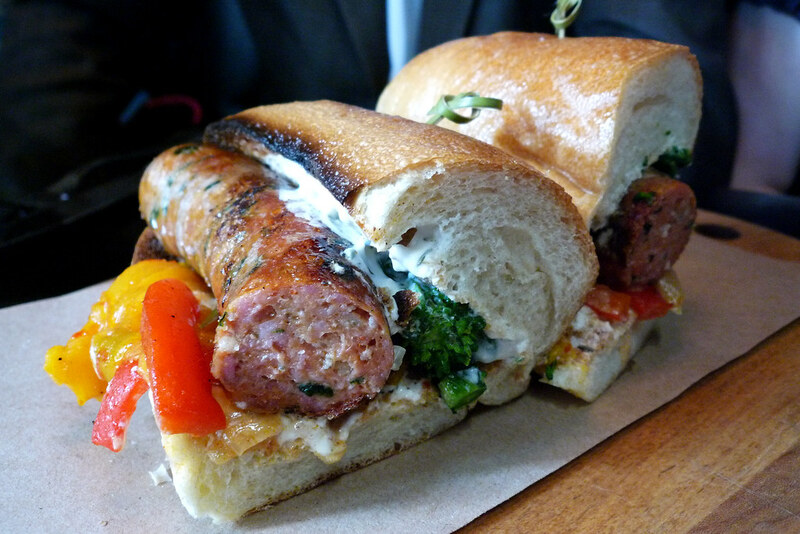 Also, the broccoli rabe sausage grinder could have contained a little more, well, broccoli rabe. It’s still a well-made sausage and a solid sandwich despite a deficiency in broccoli rabe. 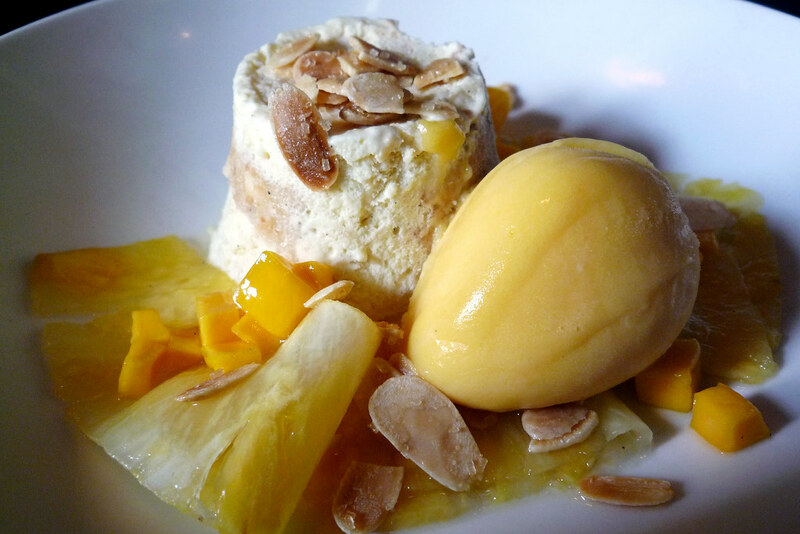 For dessert, I had the Almond Coconut Semifreddo, made up primarily of shaved pineapple, mango, mango pineapple sorbetto and, of course, a mound of whipped cream, all topped off with a mess of slivered almonds. This is a very gorgeous dessert, something I can say about all the desserts we had here. The cream and sorbetto are nice by themselves but it’s when you take your spoon and get a little bit of each onto it do you really get a great dessert. 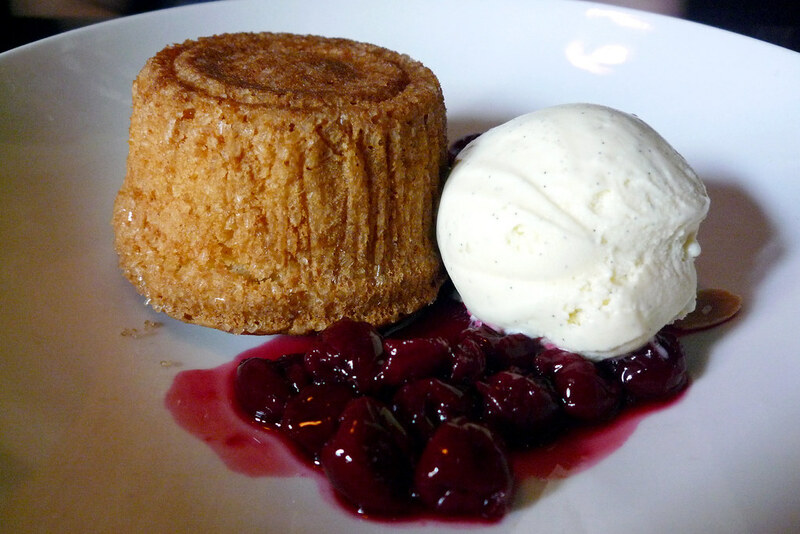 Jess had the Almond Cake and Dave G. had the Lemon Tart. Again, both were also gorgeous desserts and very good. 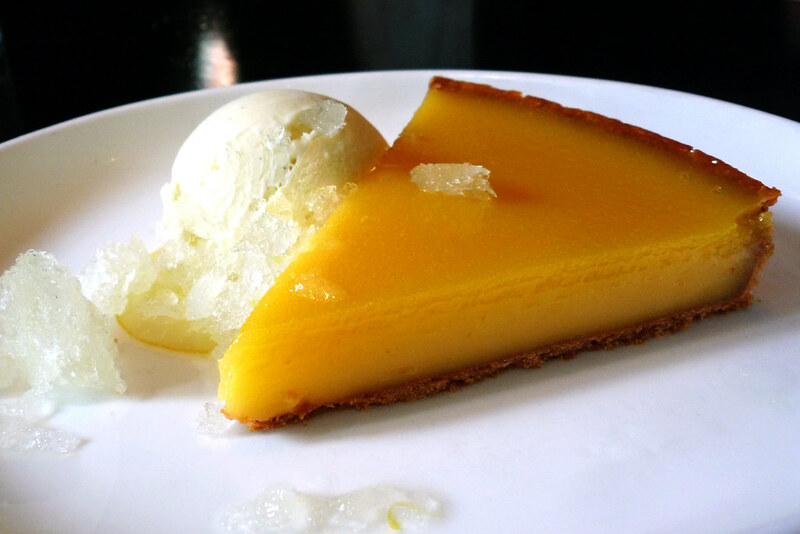 In particular, I really liked the lemon tart because of it being unabashedly lemon – in other words, it was very tart. Locanda Verde is a solid restaurant with some really good food. For what you pay, you’ll get a really nice return though I will say that two lamb meatball sliders for $12 is a bit much. I admit I know that they used to serve three per order so that may color my opinion. Also, I can’t say this enough – Carmellini’s grandmother’s ravioli is well worth the visit. It’s the epitome of a B+. Everything was well-presented and tasty. But I can’t remember much about what I ate other than that it was…..uh….well presented and tasty. And I’m not dying to go back, but if someone suggested it, I wouldn’t say no. That may be the best way to describe Locanda Verde – a nice restaurant that’s well worth visiting but maybe not something to go out of your way for once you’ve been. Locanda Verde. 377 Greenwich Street, New York, NY 10013. [Show/Hide Map] (212) 925-3797.
great post, gary. makes me wanna go for that ricotta app and stay for dessert. if i can find a vegetarian pasta in the middle that is. 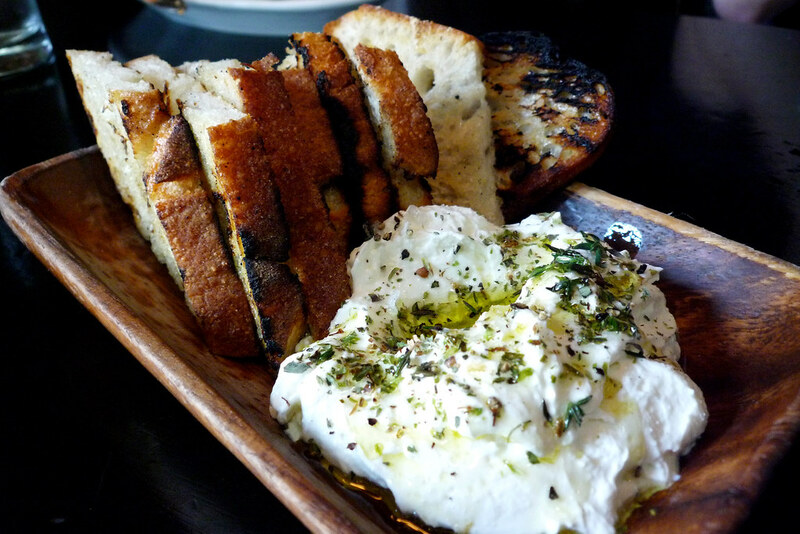 I really do think I can eat a really good ricotta all day long though I imagine I’d be sick, from it and of it, afterwards. I think it’d be worth it though.